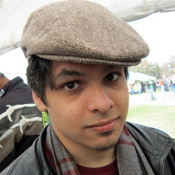 Alex Ruiz graduated in 2016 from the MFA in Creative Writing program at Rutgers University-Camden. He holds a BA in English with a minor in Theatre Arts from Rollins College. In addition to maintaining the WRI website and newsletter, he also teaches writing at Camden County College and is at work on a novel. Page last updated by Senator Walter Rand Institute for Public Affairs at 3:55 pm May 11, 2017 . This page was printed from http://rand.camden.rutgers.edu/2015/09/16/ruiz-alex/ at 4:17 PM Monday, April 22, 2019.